I’ve been struggling with my skin for a few years now, but recently it just seems to be getting worse and worse. I’ve spoken about it on Instagram quite a bit and have had lots of support and suggestions of things to try. 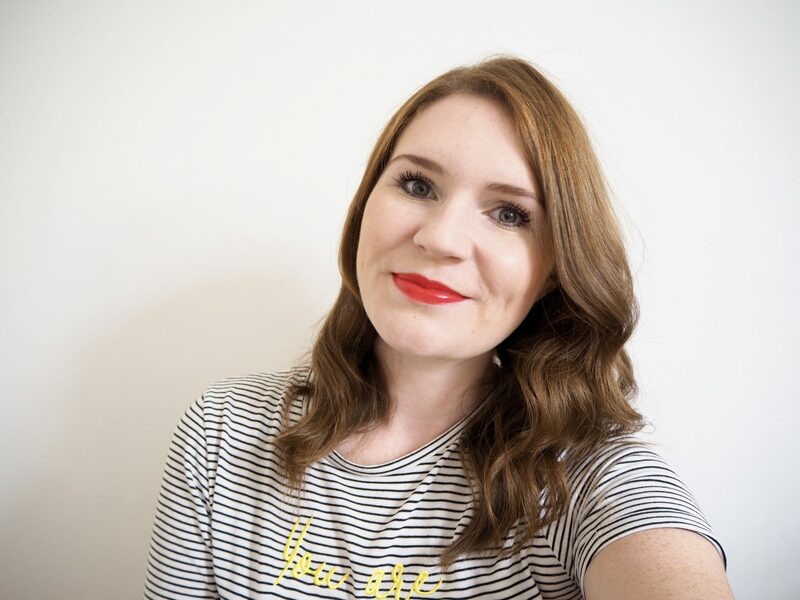 I thought I would put this post together and let you know a bit about where my skin problems started, what I’ve tried so far and what I’m currently doing to try and help my acne. As a teenager I had really good skin, and even after having my first child I still didn’t have any problems other than the occasional spot. But after I had my daughter Evie, that’s when things changed. My skin became very oily and I started to get more and more spots. I can get spots at any time of the month but I find that it is at it’s worst around the middle of my cycle. I always thought that hormonal breakouts happened around the time of your period, but often that’s when my skin is at it’s best. The spots that I get are usually big, painful cystic spots. The very worst kind. I currently have one right under my nose, it’s constantly throbbing and hurts whenever I move my face. I put up with it for a long time because I thought it would just go away eventually and you can cover most things up with makeup anyway, can’t you? But it didn’t go away, it just kept getting worse. I tried so many different products over the years and while some of them did work for a time, they soon stopped having any effect. The best product I found was the Proactiv range, you can see the post I did on that here, which includes before and after photos. It worked brilliantly for a few months and then suddenly stopped working. I had read a few reviews online that said the same thing so it didn’t really come as a suprise, but it was dissappointing to say the least. I also tried drinking three litres of water a day for a whole month – you can see that post here which also includes before and after photos. Again, it seemed to help for a short while but eventually my skin went back to normal. Since then, nothing I have tried has worked, not even temporarily. The photo on the left was taken last week. Some of what you can see in that photo is scarring. The photo on the right shows how I use makeup to try to hide my spots, but it’s at a point now where you can see them through the makeup and it makes me feel so self concious. At one point, a year or so ago I did make an appointment to see my GP. I was prescribed Zineryt which is a topical treatent. Unfortunately this did absolutely nothing for me. I had heard so many stories of people not getting help for their acne from their GP, or having to go back time and time again to ask for new treatments. It completely put me off going back. So I left it and just told myself I needed to accept it. At the end of the day it’s not effecting my health, it’s just skin, so I shouldn’t really moan should I? But as time went by my spots became more and more painful and the scarring was getting worse, so I went back to the GP. I saw a lovely doctor this time who explained that hormone changes, such as having a baby, can cause acne problems like mine. She also said that there are lots of treatents out there and it’s just a case of finding what works best for me. 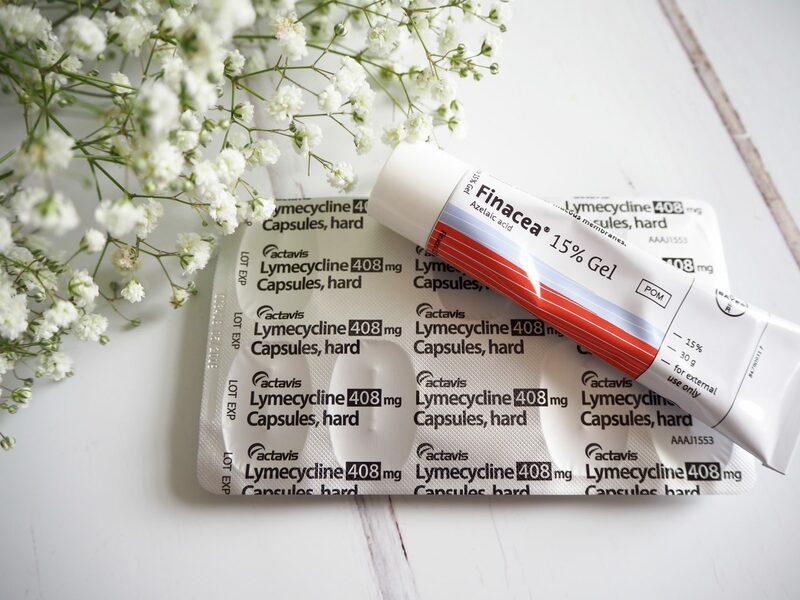 I was prescribed an antibiotic called Lymecycline and a topical treatment called Finacea. I’m not holding out much hope that these will work for me, I’m fully expecting it to take a few months before I find something that works, if at all. But it’s a start and I’m glad I’ve taken this step forward now. I haven’t noticed any side effects from the antibiotics yet but the Finacea definitely has it’s downsides. When I first apply it my skin stings and feels very hot and itchy. It’s also incredibly drying and I have large dry patches around my nose and mouth already. I will definitely keep using it for the six weeks as the doctor suggested, but so far I’m not feeling very confident about the Finacea. I will update you again in a couple of months, when I know whether these treatments are working or if I have been moved onto a new medication. If you’ve tried either of these treatements do let me know how you found them. Or if there’s a medication that worked better for you? I’d love to hear from you.